Sometimes you just need a comfort food, know what I mean? Apple pie does it for me, and this one does it best because it’s so easy to pull together. 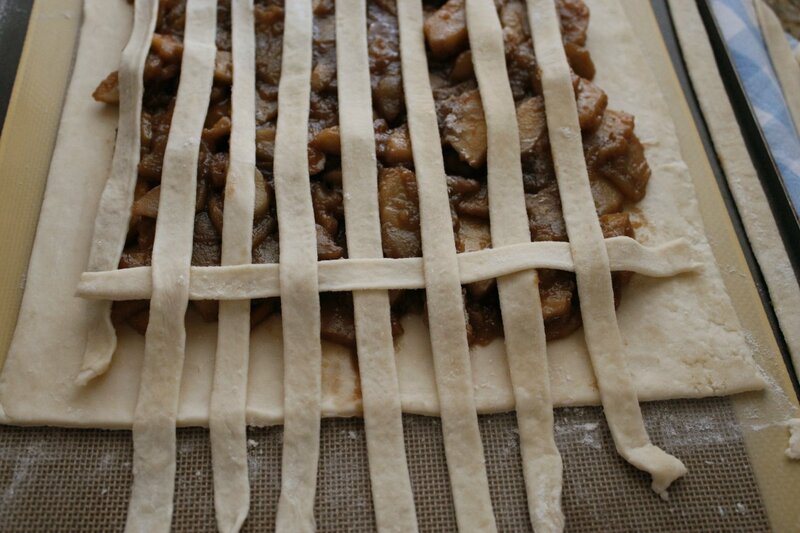 To start, mix up the pie dough as directed in the link above. Form the dough into a disc, wrap it tightly in plastic wrap and pop it into the freezer to firm up. If this pie dough recipe rings a bell, it’s because it’s my all-time favorite go-to recipe. Kirsten’s pie dough is as billed – no excuses. If you have a food processor and five minutes, you can make amazing homemade pie dough. Thanks, Kirsten! While the dough is chilling, peel, core and slice the apples and place them in a large non-stick skillet. Add the lemon juice and unsalted butter; cook over medium-high heat until the apples start to brown slightly and the liquid has evaporated. 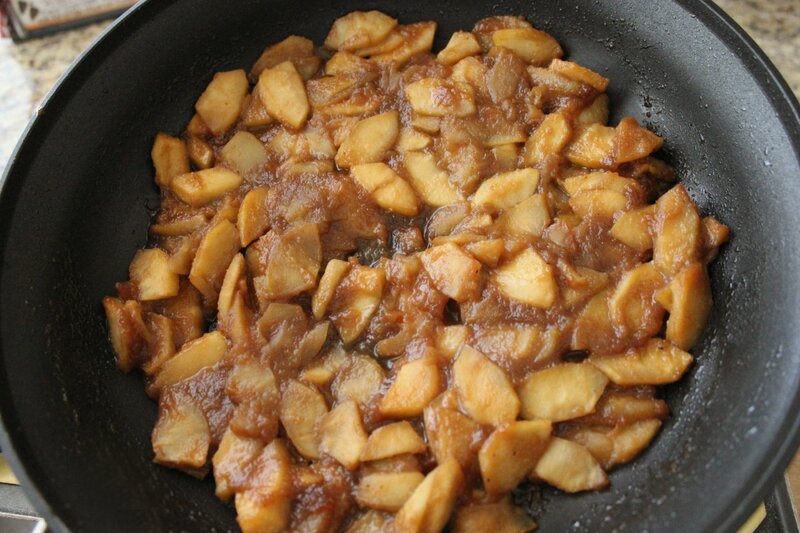 Stir in the applesauce, brown sugar and spices and continue to cook until the mixture is bubbly and the sugar begins to caramelize. Remove the pan from the heat and allow the apples to cool to room temperature. 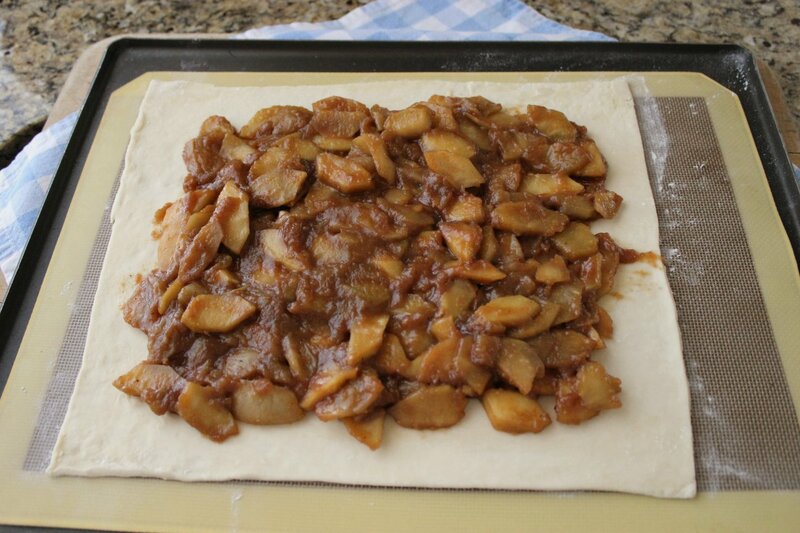 Once the apple mixture has cooled, remove the pie dough from the freezer. Generously flour your work surface and rolling-pin. Divide the dough (2/3 for the base; 1/3 for the strips on top). 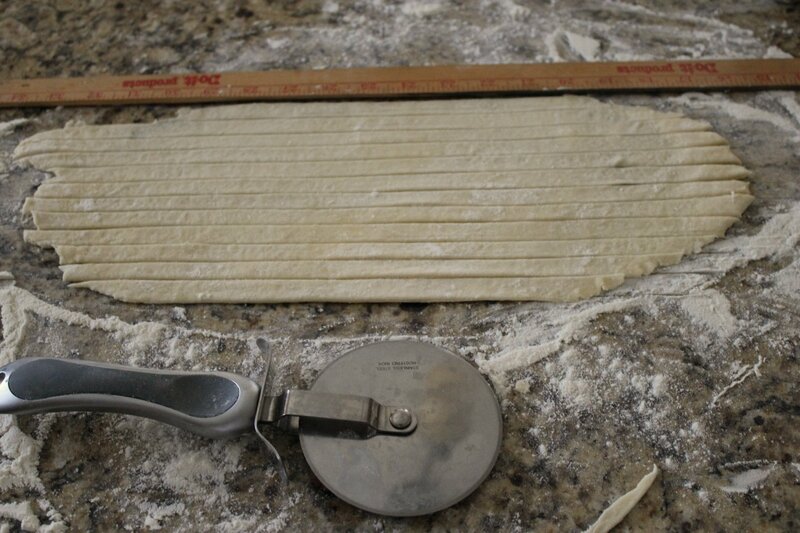 Roll the larger portion into a rectangle (the size depends on your baking sheet). I like to place mine on a silicone baking mat to prevent it from sticking and to help the bottom brown more evenly. 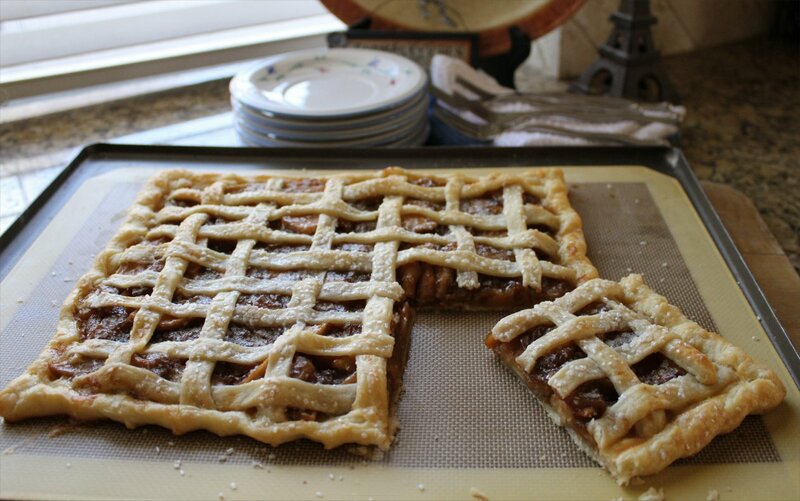 Spread the apple mixture evenly across the bottom crust, to within 1 1/2″ of the edge. Roll the remaining dough into a rectangle. 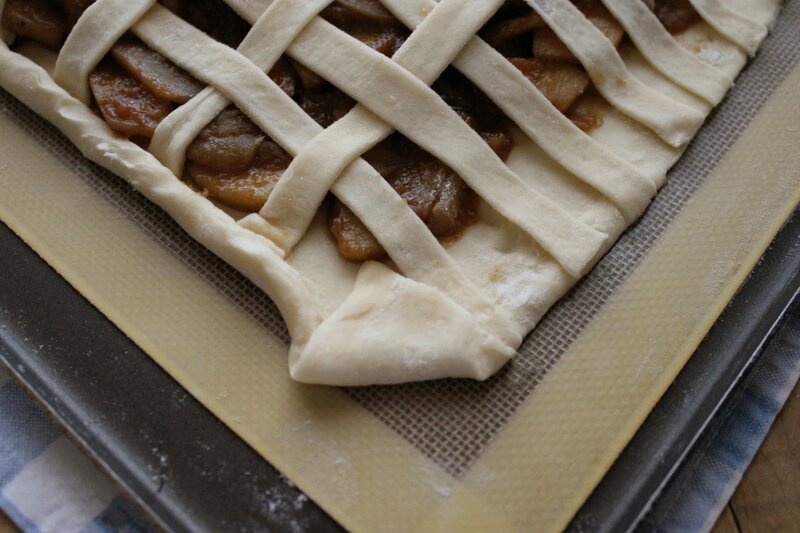 If you’re in a hurry, simply place the second rectangle over the apple mixture and cut a few steam vents in the top, then skip to the section below about finishing the edges. Lay one layer of strips in one direction, about an 1/2″ apart. Fold every other strip back about 2″ and lay your first horizontal strip, then return the folded strips back to their original position. 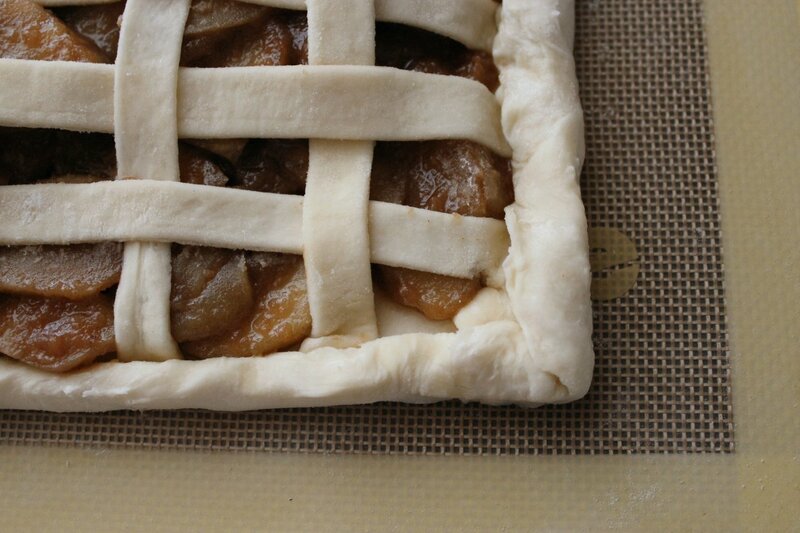 Then switch and do every other vertical line until you’ve worked all the way across the pie. If you’re starting to panic just reading this, remember you can use the second rectangle as a solid top to your slab pie. 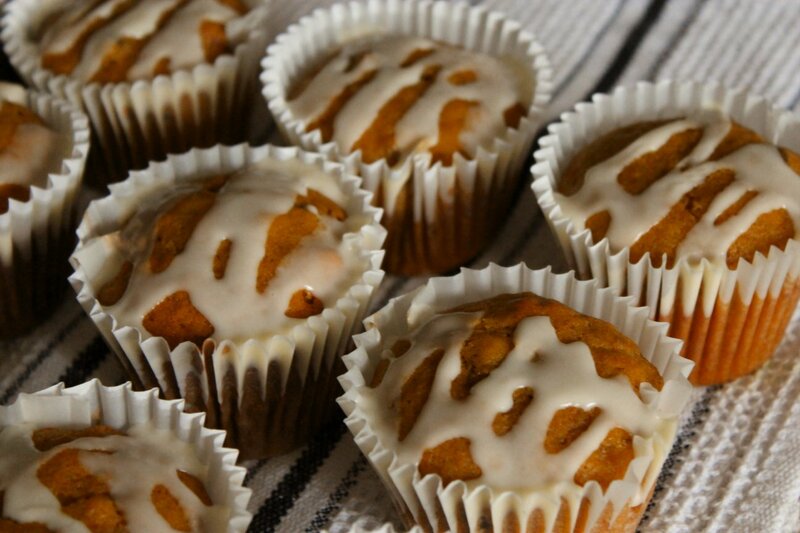 Just be sure to cut a dozen or so small steam vents into the top before baking. I’m all about giving you options. 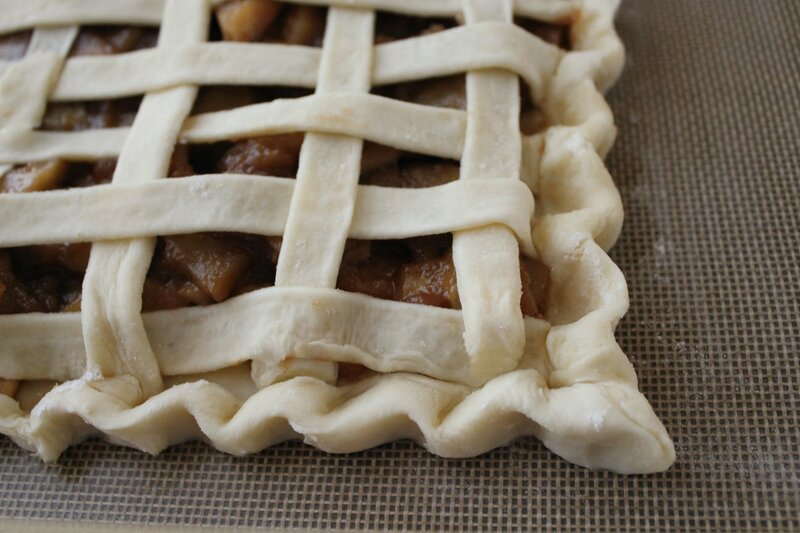 Once your top crust is on, trim off the excess so that the edges are aligned, then roll the edges inward until they are touching the edge of the apple pie filling. To help create perfectly square corners, fold each corner in before you roll the edges. That’s an old sewing trick. Thanks for teaching me to sew, Mom! You can stop here and have plain edges, and it will look perfectly fine. Or you can go for broke and flute the edge. 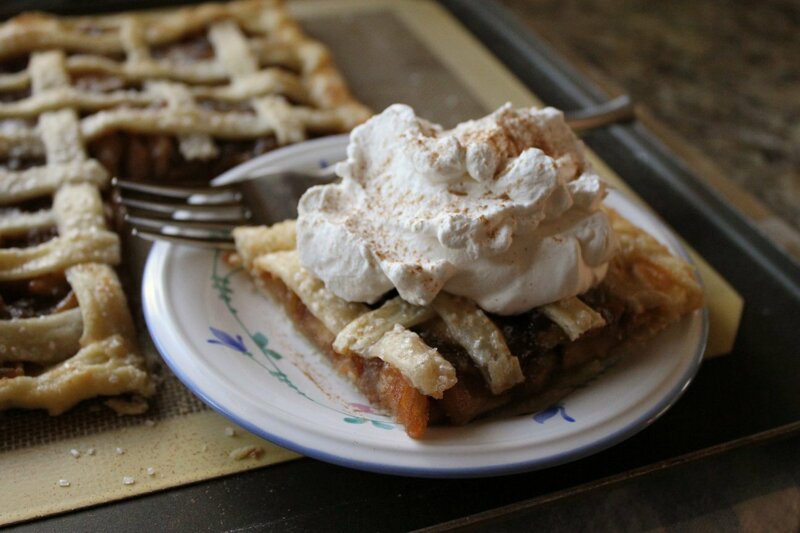 You know what they say… “go big or stay home.” Not one to shy away from a fancy-pants pie, I fluted mine. Have a few extra tablespoons of flour nearby; you’ll need it to keep your fingers from sticking to the dough while you crimp those edges. 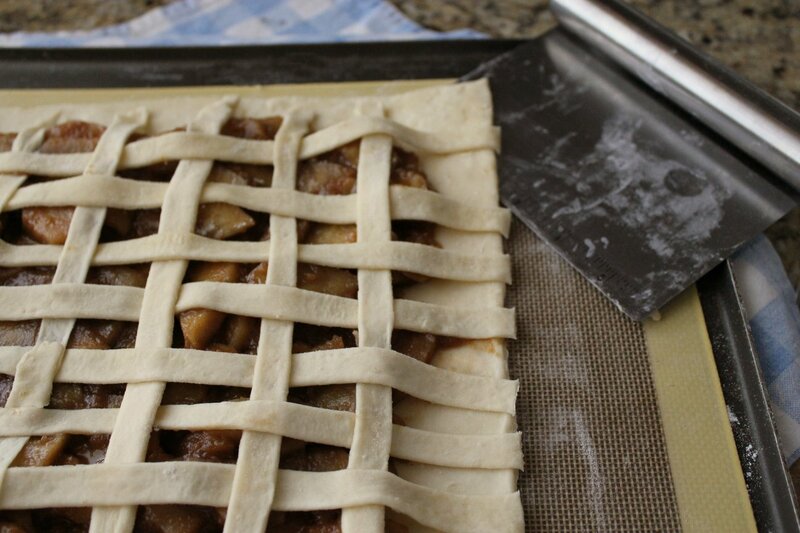 Once you’re satisfied with your crimped up primped up pie, pop it back in the freezer for at least one hour. Why? 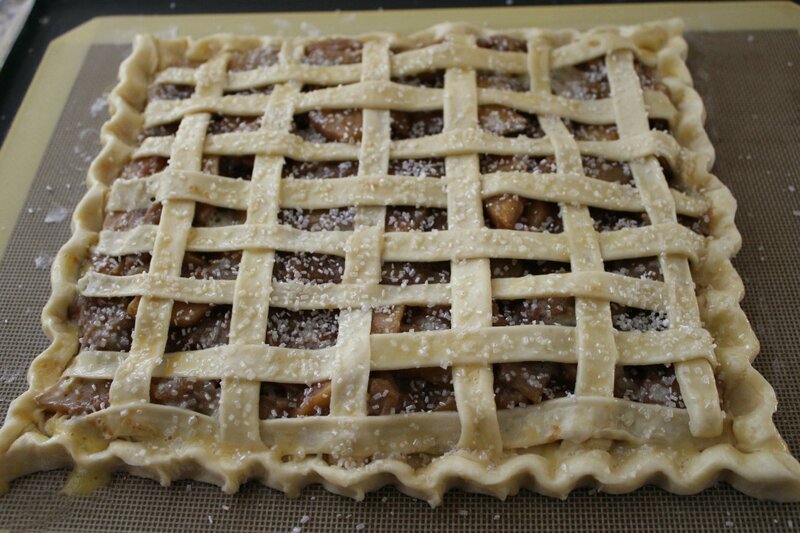 Two reasons – 1. it will help create a flakier crust if the butter is frozen when the pie goes into the hot oven, and 2. when you brush the pie with an egg wash before baking, it will prevent the brush from damaging the dough like it would at room temperature. Once your slab pie is properly frozen, remove it from the freezer and pre-heat your oven to 375F. Whisk one egg with one tablespoon of water to make an egg wash, and brush the entire pie with it making sure to coat all of the exposed pie dough. Then sprinkle with crystallized sugar or Demerara (sugar in the raw). Bake at 375F for 30 minutes, rotating the pie once after 15 minutes, or until the pie turns a light golden brown all over. Remove from the oven and allow to cool at least 10-15 minutes before serving. That’s the hardest part of this recipe. I like mine with homemade whipped cream or a scoop of vanilla ice cream, but you can do whatever floats your boat. Want a slice of cheddar on top? Go for it! Looking for an excuse to by a pint of Dulce de Leche Caramel ice cream? Do it! Whatever makes you happy. And that’s what this slab apple pie is all about – making you happy. 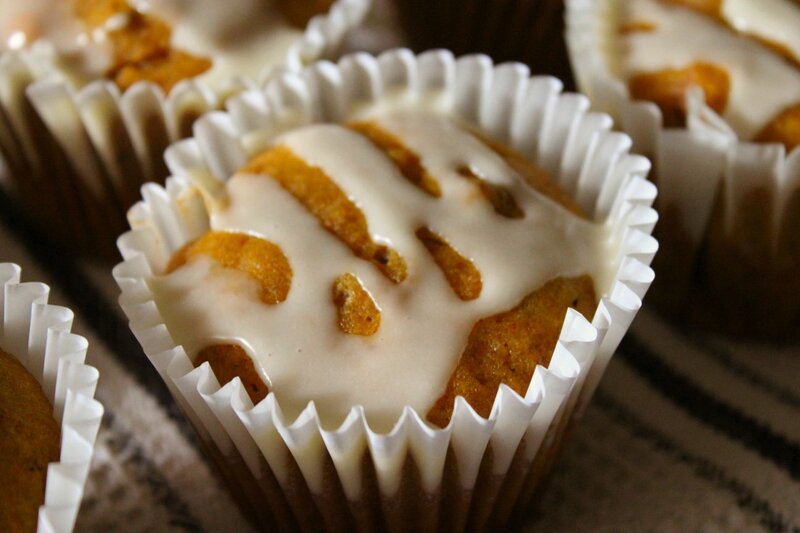 Isn’t that the goal of all our favorite comfort foods? Note from NanaBread: this slab pie can be made with almost any thick filling. 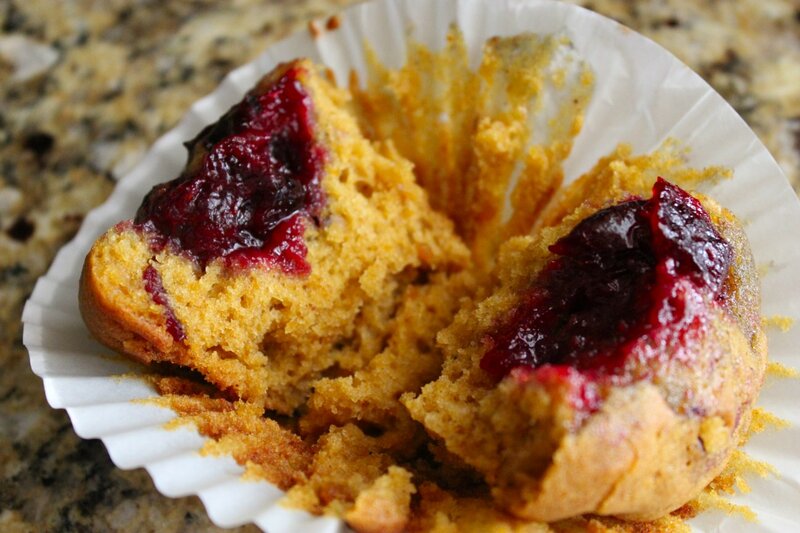 If you love canned fruit pie filling, just spoon it on and go from there. 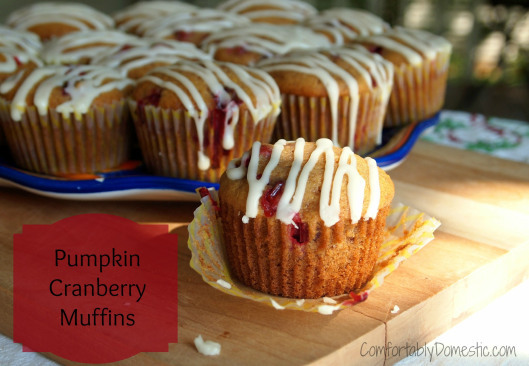 Or go fresh and try it with an apple/cranberry combo or fresh sliced plums; yum. Go nuts! And if you do, let me know what worked for you. Enjoy! 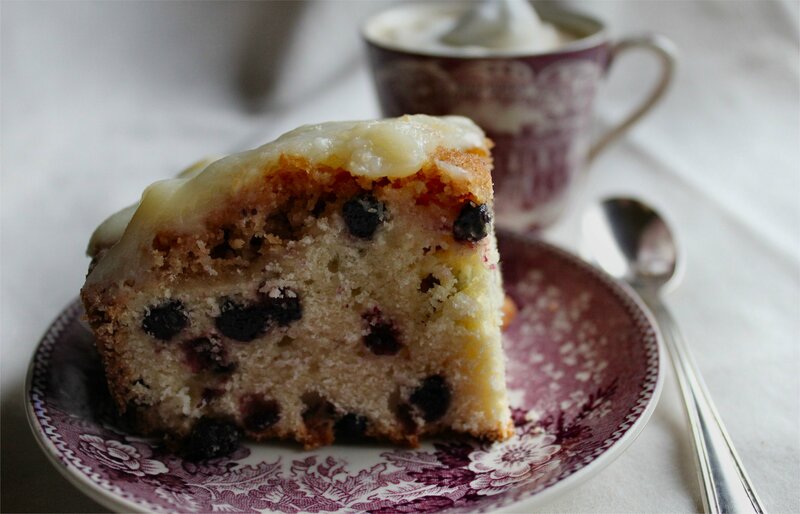 Next week is Cake Week, and in honor of our efforts to woo you with cake and as a teaser of the treats to come, I’m sharing this little snack cake to help get you in the mood. 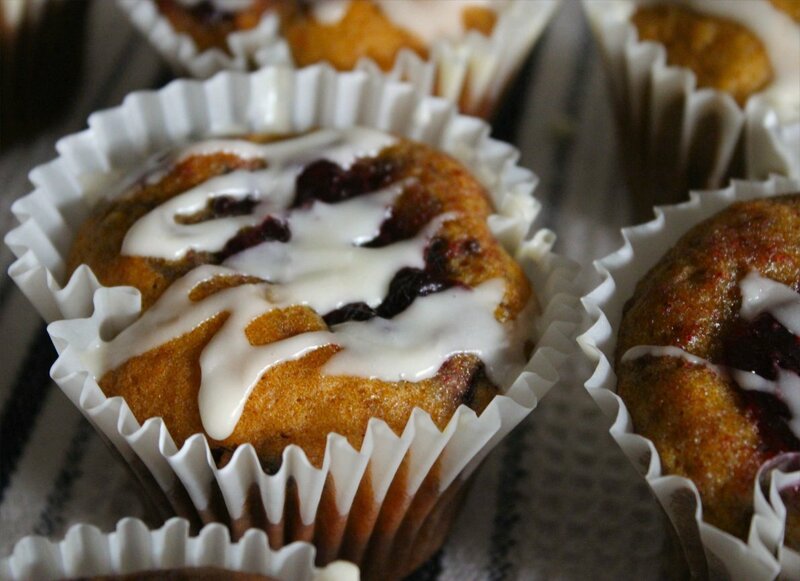 This recipe features one of my favorite things – itty bitty dried wild blueberries. They’re so sweet, they’re like candy. 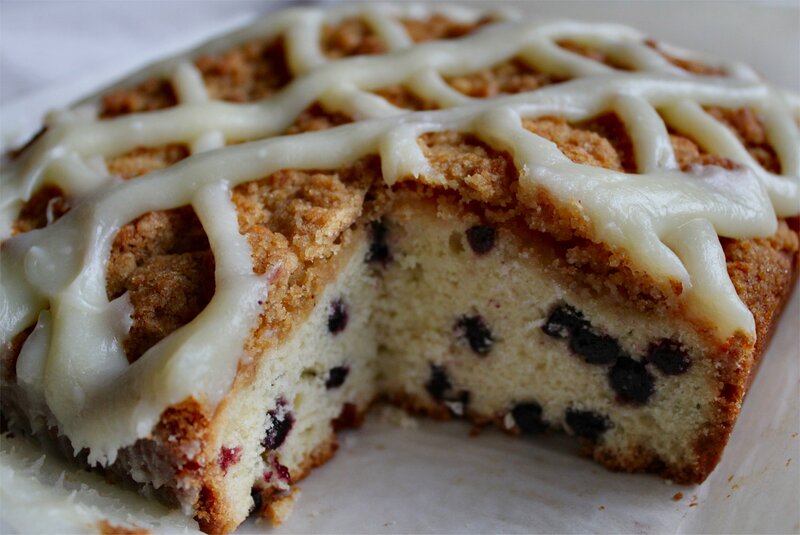 You’ll love how simple this crumb cake is to make. And it’s even more perfect warm out of the oven with your morning coffee or cup of tea. To start, pre-heat your oven to 400F. Prepare an 8″ x 8″ square pan. I use parchment paper to make a paper sling, then lightly spray it with cooking spray. To start the cake batter combine the flour, baking powder and salt in a mixing bowl, mixing with a wire whisk to blend as well as remove any lumps. Set it aside. In a large mixing bowl, beat the butter until light and fluffy, then add the sugar and continue to beat for 2 minutes more. Add the egg and almond extract; mix just until combined. Add half of the flour mixture and beat on low speed just until blended. Add the milk and mix to incorporate, then finish with the other half of the flour mixture, stopping just before the flour is fully incorporated. For a tender crumb cake, you don’t want to over mix. Scrape down the sides of the bowl, add the blueberries, and finish incorporating the flour and berries with a rubber spatula. Spoon the batter into the prepared pan and spread evenly. To make the crumb topping, combine the sugars, flour and softened butter in a mixing bowl. Beat with a wire whisk until it forms soft, lumpy crumbs. Spoon them evenly over the cake batter and place in the middle of the center rack of the oven. Bake for 25-30 minutes, or until a toothpick or skewer comes out clean from the center of the cake. Remove from the oven and allow to cool slightly before glazing or serving. If you’d like to make the optional glaze, place the cream cheese in a microwave-safe bowl. Microwave on high power for 30-45 seconds, or until the cream cheese is completely softened. Whisk in the flavorings, then slowly whisk in the powdered sugar. Add enough milk to thin to the consistency you like. Spoon or pour over the top and serve. Makes 4 very large servings or 9 regular servings. Now, I’m off to have a slice with my coffee this morning. Care to join me? Care to join me for breakfast? Coffee or tea?